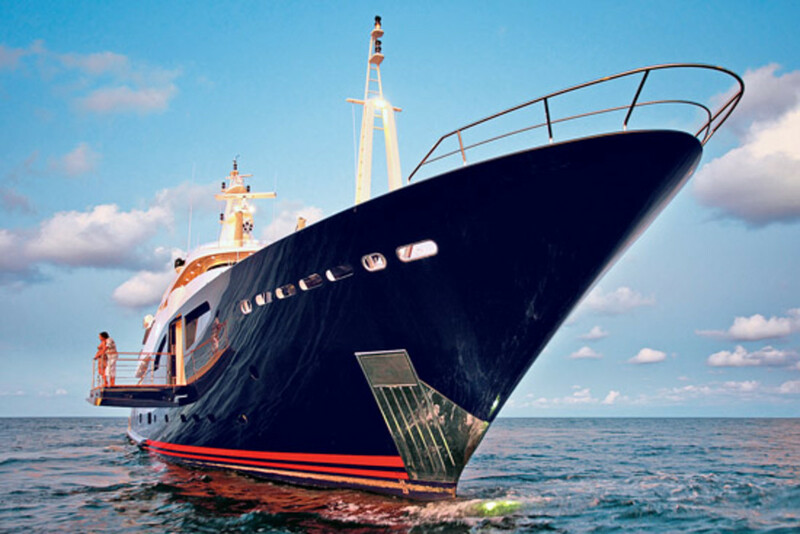 CRN keeps its Blue Eyes focused on the ocean. On many megayachts, it’s easy to forget that you are actually on the water. You can get so lost in the lavish interior spaces, in enjoying a film in that massive media room, or in soaking up sauna time that you lose sight of the fact that you’re not just staying in a hotel or a luxurious second home—you are on the ocean. Blue Eyes, CRN’s newest 196-foot displacement yacht, won’t let you forget. Thanks to her evocative interior design, a blue and white color scheme that extends from her hull to her deck furniture, and some unusual outdoor spaces, she is that all-too-rare megayacht that maintains a deep bond with the sea. 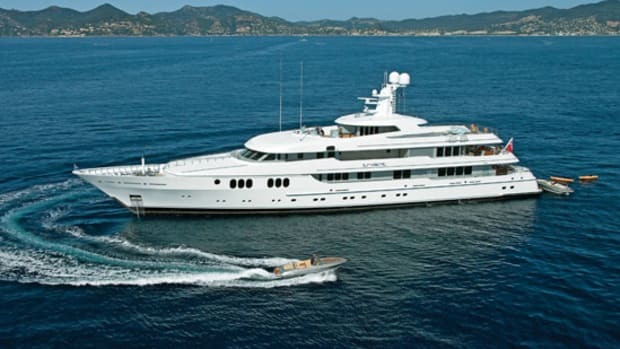 Which isn’t to say that this nearly 200-footer defies all conventions. She’s still got the alfresco areas typical of other yachts of this class, like her substantial sundeck, which sports the Jacuzzi, helipad, and sunpads that have become de rigueur. 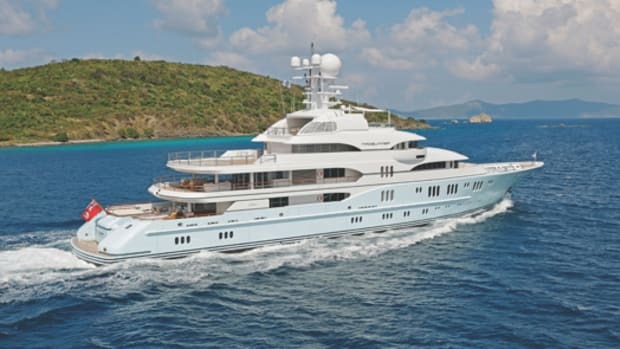 But Blue Eyes’ most impressive exterior spot lies elsewhere, in the aft area of her lower deck where CRN has taken the increasingly trendy idea of a beach club to new heights by making it, well, huge. Lowering her transom creates a teak-laid area that sits just over the water. This giant “swim platform” is part of a 650-square-foot relaxation space, complete with settees, tables, and a shaded lounge zone. It is a spectacular spot, one of the owners’ favorites, and one that I imagine will see an enormous amount of use—perhaps even more than her sundeck. Then there’s the smaller flip-down “sea terrace” off the main deck’s master suite, a feature CRN now touts as one of its trademarks. When the yacht is at anchor, the owner and his wife can relax here together, enjoying a cup of coffee and a few moments of perfect privacy while the waves lap just beneath their feet. What this means on a more concrete level is that just about every detail in Blue Eyes’ extravagant interior—designed by Laura Sessi Rombli—is loaded with meaning. Take the main saloon: According to CRN, those aren’t just sofas and armchairs you’re seeing. They were custom made with a traditionally “oriental” shape and finished with Venetian silk, two design elements meant to evoke the journey that Marco Polo once took along the Silk Road. There’s additional east-meets-west furnishing in the antique Chinese rugs, which cover the parquet floor, as well as the lamps decorated with various dragons, each associated with a different power. And then there’s even more symbolism to be found in the beautiful Chinese stones displayed in the mahogany shelves flanking the saloon’s entrance. They are said to represent good omens. Which, according to CRN, accounts for the repetition of circular shapes and spaces throughout the vessel, most notably in the circular library—complete with a white grand piano—that greets those entering the boat from the aft deck. It’s a lovely space and a nice way to welcome people onboard, rather than having them enter directly into the main saloon. Ready for more layered meaning? Consider the dining room. With its polished mahogany walls, Picasso painting, and transparent table for twelve, it might look like a room that’s all about luxury and glamour. But the use of perspex in the tables and chairs wasn’t just an aesthetic choice. The owner and his wife—who played an extremely hands-on role in designing the interior scheme—pushed for this material because they believe it picks up the light, thus “exposing the soul.” And the mirrored ceiling? Again, not just there for aesthetics. In feng shui—something the owners are dedicated to—mirrors are thought to draw in good, calm energy. More specifically, they’re said to bring in the energy of the water element. While the full-beam master suite continues this east-west theme (particularly in the attached office that features a vintage Chinese desk and a ceiling that depicts a map of the ancient winds), the four additional staterooms on the lower deck (each named after a Mediterranean wind) and the VIP on the upper all have a decidedly more restrained, more traditionally “British” feel. 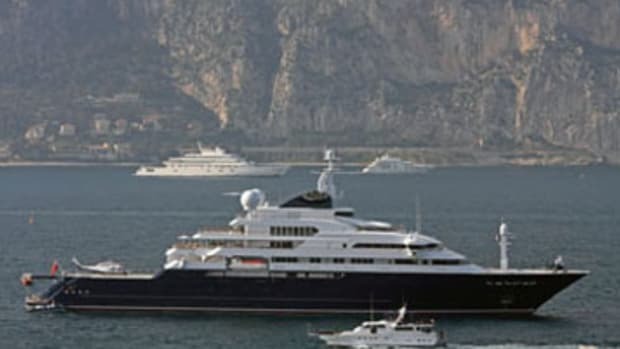 This means fewer Chinese symbols, more maps, and more polished mahogany—something that should help give these rooms a slightly broader appeal, a good thing given that Blue Eyes will be available for charter in the Caribbean for the winter and in the Western Med come summer. But then to say something like that is foolish, really. Blue Eyes’ unique interior design and appealing alfresco areas might not give her the broadest allure, but those that she does attract will surely love her. They will recognize the care and thought that went into this vessel, not just on the part of the owners, but in terms of the designers and craftsmen who worked on her. And they will understand that on this boat, every detail is fraught with meaning and every feature has been selected to remind guests of mythic themes that so many modern seafarers have long forgotten—of long passages, brave explorers, and always, the ocean. Blue Eyes brings a passion for the journey back to the deep, wide sea. CRN +39 071 501 1111. 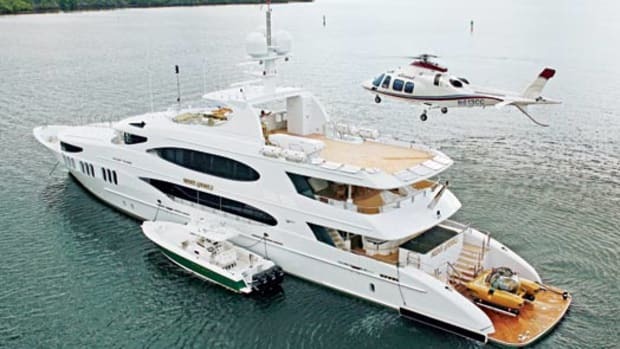 This article originally appeared in the February 2010 issue of Power & Motoryacht magazine.